My grandchildren, whom I call the “Grands,” live across America. I can’t smother them with kisses. Nor can I wipe away a tear. It is hard because I can’t solve an immediate problem or share their immediate joys because I cannot be involved in their everyday lives. For these reasons, I am truly sad about my set of circumstances. What’s a Grandmother to do that is faced with this dilemma? My only conciliation is that I do know that I am very much loved and I know that the Grands know that they are very much loved in return. When my first grandson was born, I made up my mind that I would have a consistent impact on his life. I wanted to share with him my gentleness of spirit. I wanted to reinforce family and lifetime values, understanding any and all types of needs, and I wanted to share how to come from a place of love no matter the situation. Early on I instinctively knew the greatest gift I could leave my grands. I knew because those are the greatest gifts my grandmothers and parents left to me. 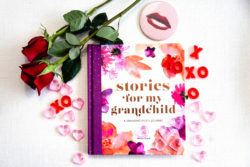 Darlings, do you know what the one true gift is that you can bestow upon your grandchildren? It is not what you leave your grands when you are dead (material possessions) but rather what you leave them in their heads…. your values and your life lessons. When my first grand was born, the separation of miles was not an issue and in fact, did not even enter my mind because my family lived a few blocks from each other in our homes in Honolulu. Unfortunately, life plays all kinds of tricks. Widowhood, a move from Honolulu to Chicago, a new husband, my daughter’s marrying, my husband’s children and Grandchildren marrying, some of the Grands off to college all over America… all proved to be wonderful on the one hand and sad on the other; I lost ‘physical touch’ with my entire family. Of course, I did despair and I still despair and yet I have come to terms that what is just is. The key was that I continue to focus on being the most proactive Grandmother from afar. From afar I accomplish my grandmother role with text messages; using my emojis of colorful hearts, rainbows, thumbs up, XOs, flowers, etc. I send emails, Facebook, phone, Skype with some, and occasionally send small gifts through the mail. It is my commitment though I must admit that sometimes, I forget, wake up in the middle of the night with an empty pit in my stomach and reach for my iPhone to send a quick text with an emoji! Now, 25 grandchildren later, I am a “Honey” to them in every sense of the word. We are bonded. I notice some of them have my traits, use my words and have digested my thoughts. I am proud of my accomplishments, from afar, with each of my grands. Establishing loving and trusting relationships and passing on my mental gifts is my ambition. To this end, I share with the Grands lessons in love and values through my words and my stories. My hope is that they will carry these teachings with them all the days of their lives. I have given you, who have my set of circumstances, some food for thought. Tell your stories; write and text, phone and Skype and when you send a note or small gift in the mail seal it with a kiss with… in your own bright red lipstick! Do something GOOD today: learn to text, Facebook, tweet and email to help stay connected with your grands in a way that works for them. How do you stay in touch with grands from afar?